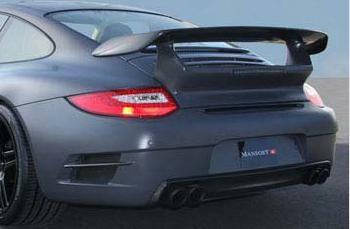 For years Mansory has been committed to perfection, craftsmanship and well-engineered technology. Mansory is headquartered in Switzerland, allowing them to stay up to date and constantly improve upon the newest Porsche offerings. Mansory stands for driving pleasure, exclusive design, and progressive engineering. Mansory's customization and cosmetic upgrades also fall in line with this philosophy. Their vast product line offers complete aerodynamic kits, ultra-light alloy rims, and powerful engine performance parts. Production up to the highest technological standard in combination with masterful workmanship and the finest materials - that is Mansory's quality standard. A vehicles aerodynamics is one of the most overlooked factors of a vehicle by enthusiasts. Improving a vehicles aerodynamics can improve gas mileage, handling, top speed, and stability. Its also a great way to improve your vehicles looks, as the aggressive lines are similar to that found on the race track. But the aggressive lines aren't just for looks; they increase down force, reduce drag, and minimize air turbulence, making your vehicle more stable at high speeds. Porsche's rear engine cars are world renowned for their handling dynamics. While a Porsche handles extremely well from the factory, there is still room for improvement, that's why Mansory developed this rear bumper. When developing the 911 Aero package, the Mansory engineers emphasized individual design without forgetting aerodynamic efficiency. In order to save weight and guarantee high quality the body components are made of composite, ensuring high durability without adding weight. The most important feature of a Diffuser is its ability to reduce the turbulence of the air passing underneath the car. This in turn reduces drag. Aside from improving your vehicles aerodynamics a rear Diffuser also improves your vehicles styling.